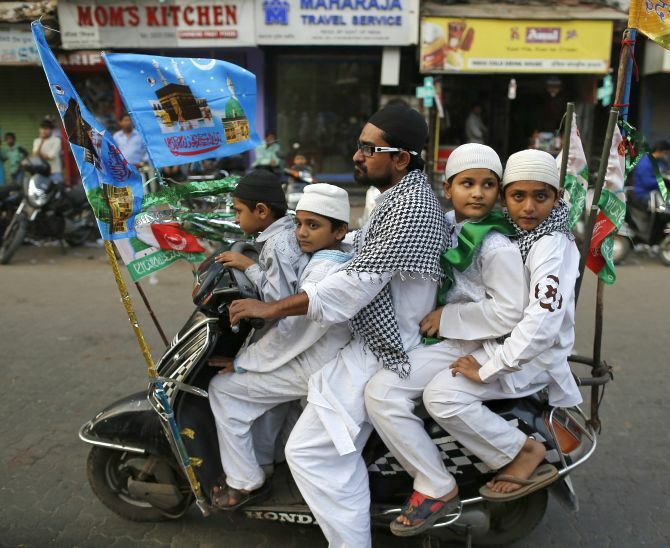 Haryana's Muslim-dominated Mewat district has the lowest immunisation rate among children under the age of six years, which is a matter of concern for the authorities who are now trying to rope in clerics to address the situation. The immunisation rate here is 13 per cent, much lower than the state average of 62.2 per cent, according to the National Family Health Survey. Officials say the rate of immunisation in Mewat is low mainly because of rumours which started spreading more than three months back that the vaccines being administered under the Central government's Indradhanush programme would have a sterilising effect on the children. With an aim of addressing the situation, top officials of the district and National Health Mission on Wednesday held an interaction with the Accredited Social Health Activists and the clerics, who agreed to render their help by negating the rumours. Maulana Yahya Kareemi, president of Al-aman Islamic Centre, Mewat, said he would speak about the "misinformation" related to the immunisation during the prayers at the mosque, including on Fridays when the number of devotees swell. "We have 400-500 youth coming to our institute every day and the number rises to over a thousand on Fridays. If the administration wants, we can spread the word quelling misinformation related to immunisation," he said. The Indradanush programme is aimed at guarding children against diseases like polio, BCG, pentavalent (diptheria, tetanus, whooping cough, hepatitis b, haemophilus, influenza type-B) rubella-measles. Officials said the immunisation rate had risen to 30 per cent but it started sliding post-February after a video went viral on social media, claiming that the injections being administered would make the children sterile and check the population of the minority community. "As of now, no such injection or tablet has been invented which could render children sterile," asserted Mewat Deputy Commissioner Mani Ram Sharma, while rubbishing the rumours. He told the gathering, which included several clerics, that the region has several people affected by polio as the Meo community had skipped the polio vaccination drive 15 years back, again due to unfound apprehensions. "I see 15-20 physically disabled youngsters coming to see me at my office every day to seek assistance in the form of employment or finances," the IAS officer said. "We can tell only you (the ASHAs and religious leaders), but it is for you to spread the word among the stakeholders and raise awareness at grassroots level," Sharma said. Director of the National Health Mission in Haryana Amaneet P Kumar also rejected the rumours and said, "They are wrong. We should have faith in science." On their part, the ASHA workers highlighted the reasons, like vehement denial by some people, for the low immunisation rate. "People hurl strong words at us, they shut their doors at us but we still make an effort to go back to such houses to ensure that no child is left out," said 48-year-old Rehmani, ASHA at Karedi village in Nagina block. Raziya, ASHA coordinator at Mewat, highlighted the insufficient number of ASHAs and Auxiliary Nurse Midwifery (village level health workers) in the district. "At present there are 874 ASHAs in Mewat as against a stipulated requirement of over 1400," said Raziya. As per the guidelines, she said, one ASHA is required for every thousand people. Also one Auxiliary Nurse Midwifery is needed for every 5,000 people but in the district it is an ANM per 15- 17,000 people. Another Islamic scholar, Hakim uddin, told the gathering of Muslim clerics and government officials besides Haryana Waqf Board CEO Hanif Qureishi, that any rumour must be checked. He also asked the community members to shun any "negative mindset" about government measures and instead verify reports/rumours. Qureishi, who is also the Commissioner of Police, Faridabad, said it was sad that health indicators in Mewat were the "lowest". "Its ramifications would not appear now but after 15-20 years," he remarked. Appealing to the community members for support in the immunisation drive, Qureishi underlined that in a democracy, the government has a social responsibility to look after the welfare of the people. "But the people have a freedom of choice, no decision can be imposed on them," he said. "This is your (religious leaders') responsibility to spread the message for welfare of the children, both for their safety as well as education," he added.